For generations now, Melbourne’s Italian community has been a rich trove of inspiration for Australia’s wildly inventive culinary scene. 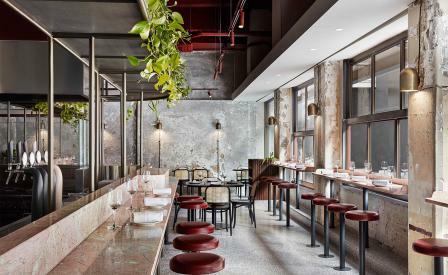 The arrival of Pentolina in the city’s buzzy Little Collins Street only adds to the lustre. Local design studio Biasol’s design scheme is a slick mix of modernity and classicism – taking design cues from Roman aesthetics, it has layered a smooth patina finish over the hand-rendered concrete walls that were uncovered during the renovations of the century-old building.The bar, too, is topped with rose coloured marble to evoke the pink granite favoured by the ancient Romans, whilst terrazzo floors, Tasmanian oak and bronze accents add warmth.